The foundations of the Cold War were, as seen in the previous section, well established by the close of WWII. This section explains the roots of the Cold War, its consequences in Europe and globally, and the major political players involved. As many in the United States and Western Europe feared, the Iron Curtain did descend upon Europe, further dividing a continent already brutally devastated by war. Throughout WWII the U.S. position was to remain friendly to the Soviet Union, as it was an extremely important ally against the Nazis. Soon after the war ended, the wartime alliance completely disintegrated. 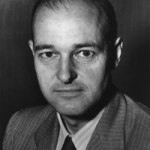 George Kennan served as Deputy Chief of Mission of the United States to the USSR from 1944 to 1946. In March 1946, he sent his famous “Long Telegram,” which outlined his critiques of the Soviet system and highlighted several concerns he had regarding the future of the two countries’ relationship. Essentially, Kennan concluded that the Soviet Union, and its brand of communism, was at war with capitalism and any country that subscribed to its ideology. Kennan warned that the Soviet Union believed that there could be no peaceful co-existence between the communist and capitalist world. Kennan and the Long Telegram influenced the Truman Doctrine and served as the foundation for American Cold War policy and containment theory. Read the primary document and discover more information on the Truman Doctrine through the image. 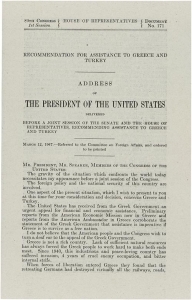 On March 12, 1947, President Truman spoke before congress and asked for $400 million in aid to Turkey and Greece. This address became known as the Truman Doctrine and was the first manifestation of containment theory as part of U.S. foreign policy toward the Soviet Union. The American government was worried Greece’s suffering economy would lead to support of the already-growing communist National Liberation Front. Additionally, they were wary of the Turkish government’s plan to enter into negotiations with the Soviet Union over control of the Dardanelle Straits, which divided Europe and Asia. Truman’s request was granted and became the foundation for U.S. Cold War foreign policy. Throughout the Cold War the United States’ top priority was to “contain” the spread communism in the world. Early on, this meant economic aid to countries vulnerable to communist and socialist rhetoric as seen in Turkey and Greece. Later, it meant war, as the United States engaged in Korea and Vietnam to defend non-communist governments from communist invasion and takeover. The Iron Curtain was a metaphor for the extreme political and ideological division that separated Western Europe from the Soviet Union and its satellite states in the east. While there was physically no structure marking this divide, the Soviet Union worked extremely hard to ensure that Western democratic and capitalist influence did not infiltrate its borders. Credits: This page was curated by CES.